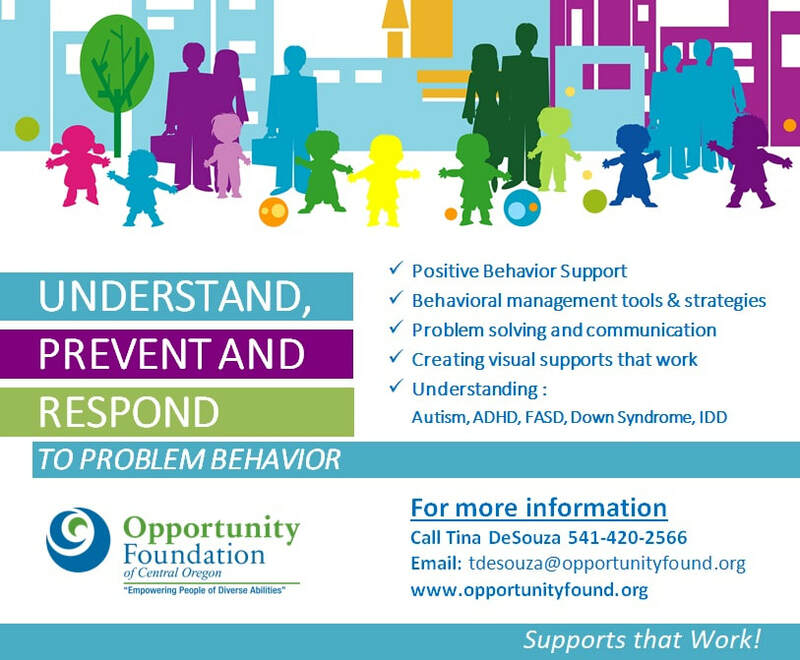 Opportunity Foundation has been providing behavioral support for individuals with disabilities since 1965. Our team of highly trained specialists are experts in creating positive, person-centered plans so individuals with disabilities can live more fulfilling, independent and inclusive lives. We offer consultation for all families and individuals who experience disabilities. Following the assessment process and input from family members, caregivers, and staff, we are able to identify what personalized tools work best for each individual we support. We offer training tailored to your family, business, or personal needs. Let us know how we can support your goals! In each class we cover how to work with people who experience a disability. For professionals, families, and anyone who wants to learn to work with people with challenging behavior. Session 1 and 2 available. Make and Take supports included in Session 2. How to maximize learning and understanding in various environments (All audiences). 2 day (12 hour) Course for families and professionals needing to be certified to work with those with a disability or needing information on how to best support people with disabilities. History of Opportunity Foundation, how to use person first language, how inclusion enhances your work environment. This class includes time for discussion as well as exercises. Information about how behavior affects us all, and meets a need for the person. Ways to work through power struggles, conflict, and stress. Safe and effective responses for supporting someone who engages in challenging behaviors, including specific physical intervention and escape techniques. Tina DeSouza, Behavior Professional who holds a degree in Psychology and Speech Therapy. She is vice chair of the Deschutes County Behavioral Health Board and a certified Oregon Intervention System (OIS) Mentor Trainer. She has 17+ years working with children and adults who experience challenging behavior. Tina is passionate about bridging gaps in cross system services, inclusive communities and helping families to be successful in their parenting journey. In her free time she enjoys skiing, hiking, kayaking in beautiful Central Oregon with her friends and family. Cierra Scurlock has a degree in Sociology from The University of Oregon and has worked for the Opportunity Foundation for over 9 years. 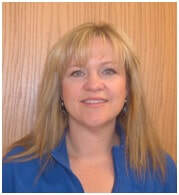 She is a certified Mentor OIS instructor and independent instructor. She specializes in providing behavior supports for adults and children with intellectual/developmental disabilities. When she isn’t providing positive behavior supports, she is singing, taking pictures or enjoying the outdoors. 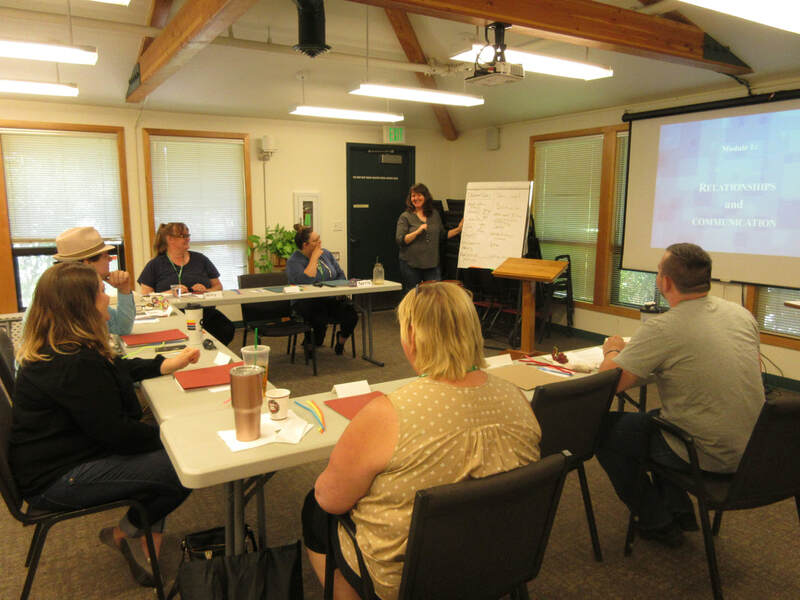 Stephanie Hunter is a Behavior Professional/OIS Mentor Trainer as well as President of Central Oregon Disability Support Network’s Board (CODSN) and an ARC Oregon board member. She has been working with children & adults that experience disability and co-occurring mental health needs for 19+ years, with 12 years providing behavior consultation throughout the State. She trains Positive Behavior Support strategies and is passionate about “meeting people where they are at” with individualized supports that are a fit for everyone involved. She believes the key to improving quality of life in our communities is strong family networks, systems collaboration, cultural competency, and unconventional thinking. She enjoys cooking, thrift shopping with her daughter, and reading science fiction. Cassandra Moses recently joined the Behavior team at Opportunity Foundation March 2018. She has experience working with Vocational Rehabilitation with the Confederated Tribes of Warm Springs, working with people who have disabilities. She's currently finishing her degree at the University of Wisconsin in Human Development and Family Studies. She will be pursuing a Master’s degree in the behavior field. She has never enjoyed her work more than when she began supporting individuals with disabilities. Cassandra feels like she can make a difference in our community but most importantly in the lives of others. In her spare time she enjoys being with family. She enjoys sewing, beading and quilting. Jackson Rich has a BS in Sociology from Montana State University. He worked in I/DD services since February 2013; Behavior Specialist since January 2017. Jackson likes to work with all types of people, but he is particularly passionate about working with families. He tries to use humor and creativity when providing services. In his free time he enjoys playing golf, mountain biking, hiking, canoeing, watching TV. Fun fact about me: I’m engaged!